NOTE TO INTRODUCER: Your remarks may introduce the video or audio, which will then introduce Dr. Willie Jolley! Please feel free to omit any portion of the introduction you deem problematic or politically incorrect for your organization! Dr. Jolley was named “…One of the Outstanding Five Speakers in the World” by Toastmasters International! Only 50 speakers worldwide have been given that honor! Former winners include Colin Powell, Nelson Mandela and Margaret Thatcher! Dr. Jolley speaks to organizations around the world - from Australia to Japan; South Africa to Jamaica; and California to Connecticut. Be More and Achieve More! He has authored several best-selling books including, It Only Takes A Minute To Change Your Life, A Setback Is A Setup For A Comeback, Turn Setbacks Into Greenbacks and An Attitude of Excellence. You can hear Dr. Willie Jolley several times a week on SiriusXM Satellite Radio with the Willie Jolley Wealthy Ways Show. 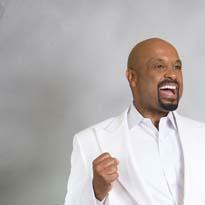 He is often seen on PBS and is a frequent guest speaker on The Hour of Power which is broadcast globally. Dr. Jolley’s goal is to help you grow and exceed your goals! Get ready for your Willie Jolley Experience!